How In-App Purchases Has Destroyed the Games Industry — fantastic before-and-after of a game, showing how it’s hollowed out for in-app-purchase upsell. the problem is that all the future generations of gamers are going to experience this as the default. They are going to grow up in a world, in which people actually think this is what gaming is like. That social engineering and scamming people is an acceptable way of doing business. 555 Footstool in the Wild — awesome furniture in the shape of the ever-popular timing chip. Every major trend was once a fringe curiosity embraced by the few with a sense of mission. The current surge of hardware innovation is no exception. A relatively small group of makers are taking advantage of inexpensive embeddable technology and new, powerful tools that are making the physical world smarter by connecting it to digital computing. Add to that the open-source sharing of code and design files, and we’re experiencing a new state of mind regarding hardware development. Rapid prototyping of new hardware ideas has never been easier or cheaper. As more people catch on, ideas and ambitions spread. We’ve seen makerspaces grow from only a handful to now approaching 1,000 in eight years. We’ve seen funding of new hardware products go from small, rare and obscure to large, frequent and regularly capturing the limelight. As the community of modern makers expands, a professional class has emerged with ambitions of taking products to market. In many cases, these “maker pros” are able to act on their own to develop their ideas, rather than needing the material resources of a larger company to get to market. However, the road to market is not an easy one, and transitioning from prototype to a shipped product is a challenging path often wrought with difficulties. Peter Semmelhack, author of “Social Machines: How to Develop Connected Products that Change Customer’s Lives” and founder of BugLabs, will be the keynote. Bre Pettis, CEO of MakerBot, will talk about the new digitizer scanner in addition to the exciting developments of MakerBot 3D printers. Christine Furstoss, global technology director of manufacturing & materials technologies at GE Global Research Center, will talk about the industrial use of 3D printers. Carla Diana of Smart Interaction Labs will talk about interaction design. Massimo Banzi of Arduino and Jason Kridner of BeagleBone will talk about new embedded controllers and processors. Chris Dixon of Andreeson Horowitz will be one of several VCs talking about the hardware themes that interest them most. Bunnie Huang, expert hacker and maker, will discuss manufacturing for makers. Ben Einstein of Bolt, a maker accelerator, along with Scott Miller, CEO of Dragon Innovation and also of Bolt, will talk about getting to market. Alasdair Allen of Data Sensing Labs will talk about sensor platforms. Ayah Bdeir, founder and CEO of littleBits, will present a case study. David Lang, author of newly published “Zero to Maker,” will talk about learning enough making skills to be dangerous and about the OpenROV project. From Scobelizer’s Robert Scoble to futurist Brian David Johnson, this event will cover the “state-of-the-art” in hardware innovation from many different perspectives. We’ll have makers who have been pioneers in developing new products, but we’ll also see up-and-coming product ideas in Pitches with Prototypes. Finally, the Hardware Innovation Workshop will conclude with an evening reception, where the 2013 winner of the Next Top Makers competition will be announced and the six finalists of the Pitch Your Prototype competition will display and demo their projects and ideas. Here’s more information on the full program for the Hardware Innovation Workshop. Here’s information on workshop registration. bletchley (Google Code) — Bletchley is currently in the early stages of development and consists of tools which provide: Automated token encoding detection (36 encoding variants); Passive ciphertext block length and repetition analysis; Script generator for efficient automation of HTTP requests; A flexible, multithreaded padding oracle attack library with CBC-R support. Maker Camp 2013: A Look Back (YouTube) — This summer, over 1 million campers made 30 cool projects, took 6 epic field trips, and met a bunch of awesome makers. Memory Allocation in Brains (PDF) — The results reviewed here suggest that there are competitive mechanisms that affect memory allocation. For example, new dentate gyrus neurons, amygdala cells with higher excitability, and synapses near previously potentiated synapses seem to have the competitive edge over other cells and synapses and thus affect memory allocation with time scales of weeks, hours, and minutes. Are all memory allocation mechanisms competitive, or are there mechanisms of memory allocation that do not involve competition? Even though it is difficult to resolve this question at the current time, it is important to note that most mechanisms of memory allocation in computers do not involve competition. Does the dissector use a slab allocator? Tip your waiter, try the veal. Innovate Salone — finalists from a Sierra Leone maker/innovation contest. Part of David Sengeh‘s excellent work. Arts, Humanities, and Complex Networks — ebook series, conferences, talks, on network analysis in the humanities. Everything from Protestant letter networks in the reign of Mary, to the repertory of 16th century polyphony, to a data-driven update to Alfred Barr’s diagram of cubism and abstract art (original here). Raspberry Pi Wireless Attack Toolkit — A collection of pre-configured or automatically-configured tools that automate and ease the process of creating robust Man-in-the-middle attacks. The toolkit allows your to easily select between several attack modes and is specifically designed to be easily extendable with custom payloads, tools, and attacks. The cornerstone of this project is the ability to inject Browser Exploitation Framework Hooks into a web browser without any warnings, alarms, or alerts to the user. We accomplish this objective mainly through wireless attacks, but also have a limpet mine mode with ettercap and a few other tricks. Industrial Robot with SDK For Researchers (IEEE Spectrum) — $22,000 industrial robot with 7 degrees-of-freedom arms, integrated cameras, sonar, and torque sensors on every joint. [...] The Baxter research version is still running a core software system that is proprietary, not open. But on top of that the company built the SDK layer, based on ROS (Robot Operation System), and this layer is open source. In addition, there are also some libraries of low level tasks (such as joint control and positioning) that Rethink made open. There are few ways to better judge a nation’s character than to look at how its children are educated. What values do their parents, teachers and mentors demonstrate? What accomplishments are celebrated? In a world where championship sports teams are idolized and superstar athletes are feted by the media, it was gratifying to see science, students and teachers get their moment in the sun at the White House last week. An increasingly fierce global competition for talent and natural resources has put a premium on developing scientists and engineers in the nation’s schools. (On that count, last week, the President announced a plan to promote careers in the sciences and expand federal and private-sector initiatives to encourage students to study STEM. Unfortunately, the role models that far too much of the media hold up for young people are all too frequently pulled from the stage, screen and playing fields, as opposed to laboratories, universities and schools. In recent years, the success of technology entrepreneurs has shifted that dynamic, but in the American academy, big time sports have been eating college life, with huge stadiums and rallies for stars and comparatively little notice given to National Merit awards or fellowship winners. When the President said in 2012 that science, technology, engineering and math (STEM) education and young people’s scientific achievements don’t belong in the back pages of newspapers, his media criticism was quietly scathing: a culture of celebrity is not geared to the more quiet, sustained achievement required to attain a graduate degree or patent, though both may have more enduring value to society than a pop album. This is a dynamic that clearly troubles President Obama, and one that he has used the bully pulpit and the platform of the White House to drawn national attention towards over the past five years. In the years since, the White House has tried to carry through on that pledge, hosting three science fairs and involving national leaders in science education, including Bill Nye,”The Science Guy,” Reading Rainbow host Levar Burton, and astrophysicist Neil deGrasse Tyson. 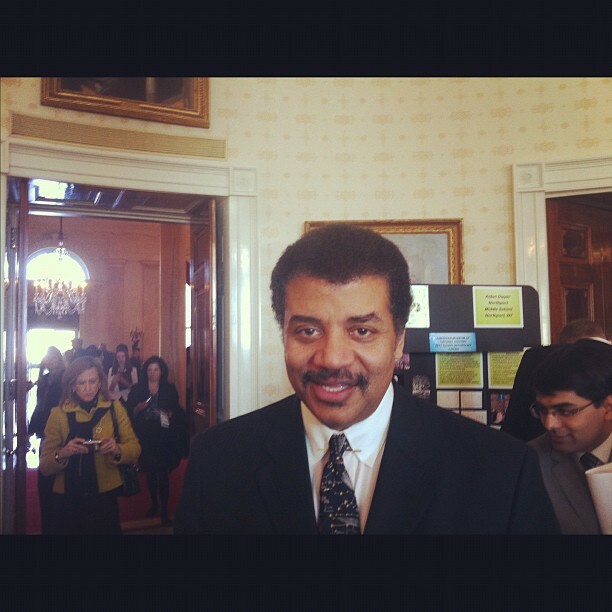 “The White House Science Fair is a way of showing everyone that science is cool,” said Tyson, the director of the Hayden Planetarium in New York City, in an interview. Engaging the public about the wonders of the universe and encouraging kids to be curious about how our world works has been a core part of his career, driven by his infectious good humor. As Greg Ferenstein noted at TechCrunch, there were some pretty awesome inventions at the White House science fair, from mind-controlled prosthetics to improved cancer detection methodologies to a bicycle-powered water purification system. 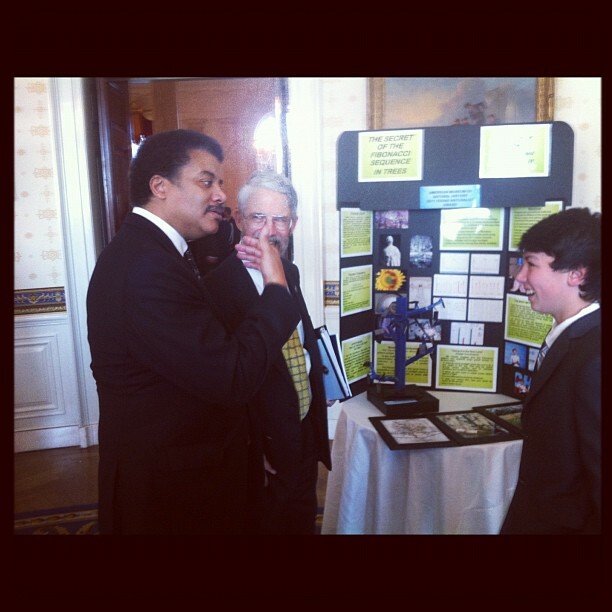 You can see a list of the White House science fair projects at WhiteHouse.gov and watch President Obama tour the exhibits on YouTube. One of the notable components of the science fairs has been the involvement of kids from the maker movement. In the summer of 2013, the Maker Education Initiative will host a season-long Maker Party where students can learn, design and create. “We’re a nation of tinkerers and dreamers and believers in a better tomorrow,” said President Obama at the 2012 White House Science Fair, recognizing the long-history of creative innovation in American garages, basements and barns. In 2012, President Obama famously helped young maker Joey Hudy to fire his “extreme marshmallow cannon.” 14-year old Ben Hylack, the maker of a telepresence robot, said that Makerfaire changed his life. In 2013, “Super Awesome Sylvia” represented Maker Faire at the White House Science Fair, showing the President her watercolor drawbot. Experimenting with more independent projects that let kids tinker are important but only part of a puzzle that includes parents, teachers and libraries. For that to happen, we’ll need to encourage children to keep asking questions, teach them how to learn to answer them, and praise inquisitive students. Chris Anderson wrote Makers and went from editor-in-chief of Wired to CEO of 3D Robotics, making his hobby his side job and then making it his main job. A new executive at Motorola Mobility, a division of Google, said that Google seeks to “googlify” hardware. By that he meant that devices would be inexpensive, if not free, and that the data created or accessed by them would be open. Motorola wants to build a truly hackable cellphone, one that makers might have ideas about what to do with it. Regular hardware startup meetups, which started in San Francisco and New York, are now held in Boston, Pittsburgh, Austin, Chicago, Dallas and Detroit. I’m sure there are other American cities. Melbourne, Stockholm and Toronto are also organizing hardware meetups. Hardware entrepreneurs want to find each other and learn from each other. Hardware-oriented incubators and accelerators are launching on both coasts in America, and in China. The market for personal 3D printers and 3D printing services has really taken off. 3D printer startups continue to launch, and all of them seem to have trouble keeping up with demand. MakerBot is out raising money. Shapeways raised $30 million in a new round of financing announced this week. Makers are discovering that the Raspberry PI, developed for educational uses, can fit into some interesting commercial niches. The marketing-friendly phrase, “Internet of Things,” is beginning to mean something, with new boards such as Pinoccio and Electric Imp. Design software is getting better, and less expensive, if not free, although the developers of TinkerCad announced that they were abandoning it. And an 11-year old maker, Super Awesome Sylvia, was recognized at the White House Science Fair, exhibiting a watercolor robot that will soon be a kit sold through Evil Mad Science. “Hardware is the new software” reported Wired and the New York Times. Joi Ito of the MIT Media Lab said it was one of the top trends to watch in 2013. This year’s Hardware Innovation Workshop, held May 14-15 at the College of San Mateo in San Mateo, Calif., during the week leading up to Maker Faire Bay Area, will provide a deep dive into the new world of hardware startups. You’ll learn what VCs are thinking about hardware startups, which startups got funding and why. You’ll meet dozens of newly formed startups that haven’t launched yet. You’ll also learn from maker case studies and from the founders of hardware incubators. Learn more about the Hardware Innovation Workshop. O’Reilly Radar readers can register using the code “RADAR13″ and save $100. The big machines that define modern life — cars, airplanes, furnaces, and so forth — have become exquisitely efficient, safe, and responsive over the last century through constant mechanical refinement. But mechanical refinement has its limits, and there are enormous improvements to be wrung out of the way that big machines are operated: an efficient furnace is still wasteful if it heats a building that no one is using; a safe car is still dangerous in the hands of a bad driver. It is this challenge that the industrial internet promises to address by layering smart software on top of machines. The last few years have seen enormous advances in software and computing that can handle gushing streams of data and build nuanced models of complex systems. These have been used effectively in advertising and web commerce, where data is easy to gather and control is easy to exert, and marketers have rejoiced. Thanks to widespread sensors, pervasive networks, and standardized interfaces, similar software can interact with the physical world — harvesting data, analyzing it in context, and making adjustments in real-time. The same data-driven approach that gives us dynamic pricing on Amazon and customized recommendations on Foursquare has already started to make wind turbines more efficient and thermostats more responsive. It may soon obviate humans as drivers and help blast furnaces anticipate changes in electricity prices. An electric furnace at the Allegheny Ludlum Steel Corp. in Brackenridge, Pa. Circa 1941. Those networks and standardized interfaces also make the physical world broadly accessible to innovative people. In the same way that Google’s Geocoding API makes geolocation available to anyone with a bit of general programming knowledge, Ford’s OpenXC platform makes drive-train data from cars available in real-time to anyone who can write a few basic scripts. That model scales: Boeing’s 787 Dreamliner uses modular flight systems that communicate with each other over something like an Ethernet, with each component presenting an application programming interface (API) by which it can be controlled. Anyone with a brilliant idea for a new autopilot algorithm could (in theory) implement it without particular expertise in, say, jet engine operation. Draw data from wide sensor networks and optimize systems in real-time. Replace both assets and labor with software intelligence. Bring the software industry’s rapid development and short upgrade cycles to big machines. Mask the underlying complexity of machines behind web-like APIs, making it possible for innovators without specialized training to contribute improvements to the way the physical world works. Create a valuable flow of data that makes decision making easier and more accurate for the operators of big machines as well as for their clients and suppliers. Our report draws on interviews with industry experts and software innovators to articulate a vision for the coming-together of software and machines. 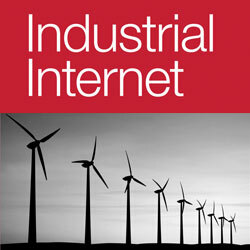 Download the full report for free here, and also read O’Reilly’s ongoing coverage of the industrial internet at oreil.ly/industrial-internet. * We have adapted our style over the course of our industrial internet investigation. We now use lowercase internet to refer generically to a group of interconnected networks, and uppercase Internet to refer to the public Internet, which includes the World Wide Web. The growth of the Maker movement has been nothing if not amazing. We’ve had more than 100,000 people at Maker Faire in San Francisco, and more than 50,000 at the New York event, with mini-Maker Faires in many other cities. Arduino is almost a household word, along with Raspberry Pi. Now that O’Reilly has spun out Maker Media as an independent company, we look forward to the continued success of these events; they’re signs of an important cultural shift, a rejection of a prefabricated, shrink-and bubble-wrap economy that hasn’t served us well. The Make movement has proven that there are many people who want the joy of creating, whether it’s a crystal radio, a custom head for a Pez dispenser, or glowing e coli. But the Maker movement is not just about hobbyists. We’ve seen a lot in print about the re-shoring of American manufacturing, the return of the manufacturing jobs that had been exported to China and the Far East over the past few decades. One of the questions we’re asking at O’Reilly is what the Maker movement has to do with the return of manufacturing. If the return of manufacturing just means lots of low-level industrial jobs, paying barely more than minimum wage and under near-slavery conditions, that doesn’t sound desirable. That also doesn’t sound possible, at least to me: whatever else one might say about the cost of doing business in the U.S., North America just doesn’t have the sheer concentrations of people needed to make a Foxconn. Of course, many of the writers who’ve noted the return of manufacturing have also noted that it’s returning in a highly automated way: instead of people running around a warehouse, you’ll have Kiva robots doing the running. Instead of skilled machinists operating milling machines, you’ll have highly automated computer controlled machines with a small number of humans to test the parts and make sure they’re operating properly. This vision is more plausible — even likely — but while it promises continued employment for the engineers who make the robots, it certainly doesn’t solve any problems in the labor market. But just as small business has long been the cornerstone of the U.S. economy, one wonders whether or not small manufacturing, driven by “professional Makers,” could be the foundation for the resurgence of manufacturing in the U.S. A number of innovations have made this shift conceivable. One of the most important is the ease with which makers can raise money to get a business started. Thanks to Kickstarter, initial funding for a small business is a lot easier than it used to be. Kickstarter isn’t alone; IndieGoGo, Selfstarter, and many others also enable Makers to raise money without running the venture capital gauntlet. There’s also been an amazing drop in the cost of tooling. Not long ago, 3D printers, laser cutters, and computer-controlled milling machines were tools that enthusiasts could only dream about. Now you can get a 3D printer for a few hundred dollars, and a laser cutter for a couple of thousand. If you don’t want to own your own 3D printer, they’re starting to appear in storefronts and copy shops. Online fabrication services exist for everything from printed circuit boards to DNA. You design what you want online, click a button, and a few weeks later, a batch of PC boards, or 3D printed parts, or plasmids with custom DNA, arrive. This isn’t new, but it’s becoming easier all the time. Autodesk has apps for your iPad that let you design for a 3D printer; you can easily send the design to the copy shop or library for production. In the 20th-century economy, one barrier to starting a new business was establishing a sales channel. That’s another problem that’s been solved recently. There are new outlets and sales channels that specialize in micro-manufacturing. Etsy is the most well known; Tindie is a newer entry that caters to electronics; and I believe we will see many more online marketplaces specializing in small manufacturers. 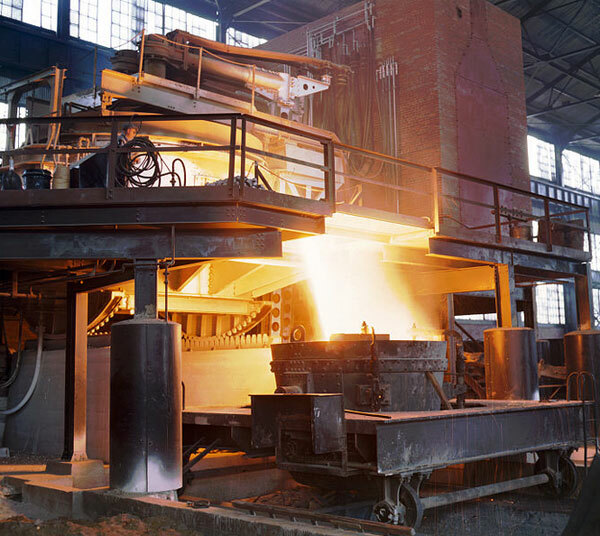 There’s more at stake in re-invigorating small manufacturing than just adding to the economy. Several years ago, I was in a meeting with Bunnie Huang, founder of Chumby, where he said that the United States had lost the engineering skills needed to do manufacturing. The engineers needed to do product development, to take a raw design and figure out how to produce it, no longer existed in the U.S., at least in sufficient numbers to support a manufacturing economy. As manufacturing had gone offshore, so had the people who knew how to do it. A product like the iPhone isn’t manufactured in China because it’s cheaper; it’s manufactured in China because that kind of manufacturing just can’t be done in the United States. Part of a reboot of American manufacturing means home-growing the product engineering and development smarts that we’ve lost over the years; and professional Making, Makers turning their ideas and passions into products, is necessary to re-develop the talent and experience that are in short supply. If you’re a professional maker, we’d like to hear your story. What kind of a business are you running? Do you have, or foresee having, employees? What kind of an impact has your business had on your community? I’ve seen too many small towns going to ruin around an abandoned factory. The people with the skills are still there, but the jobs left years ago. Can the Maker movement make an appreciable change in local economies? And if small numbers of makers can contribute to a local economy, what can the entire movement do for the national economy? We’re waiting for your answers. The Internet has thrived on abstraction and modularity. Web services hide their complexity behind APIs and standardized protocols, and these clean interfaces make it easy to turn them into modules of larger systems that can take advantage of the most intelligent solution to each of many problems. The Internet revolutionized the software-software interface; the industrial Internet will revolutionize the software-machine interface and, in doing so, will make machines more accessible. I’m using “access” very broadly here — interfaces will make machines accessible to innovators who aren’t necessarily experts in physical machinery, in the same way that the Google Maps API makes interactive mapping an accessible feature to developers who aren’t expert cartographers and front-end developers. And better access for people who write software means wider applications for those machines. I’ve recently encountered a couple of widely different examples that illustrate this idea. These come from very different places — an aerospace manufacturer that has built strong linkages between airplanes and software, and an advanced enthusiast who has built new controllers for a pair of industrial robots — but they both involve the development of interfaces that make machines accessible. The Centaur, built by Aurora Flight Sciences, is an optionally-piloted aircraft: it can be flown remotely, as a drone, or by a certified pilot sitting in the plane, which satisfies U.S. restrictions against domestic drone use. Customers include defense agencies and scientists, who might need a technician onboard to monitor equipment in some cases but in others send the plane on long trips well beyond a human’s comfort and safety limitations. The intelligence that Aurora layers onto its planes reduces the entire flight process to an API. The Centaur can even be flown from the pilot’s seat in the plane through the remote-operator control. In other words, Aurora has so comprehensively captured the mechanism of flight in its software that a pilot might as well fly the airplane he’s sitting in through the digital pipeline rather than directly through the flight deck’s physical links. The simplified interface between humans and the Centaur’s combined machinery and software might eventually make flight vastly more accessible. “What we think the robotic revolution really does is remove operating an air vehicle from the priesthood that it’s part of today, and makes it accessible to people with lower levels of training,” he says. 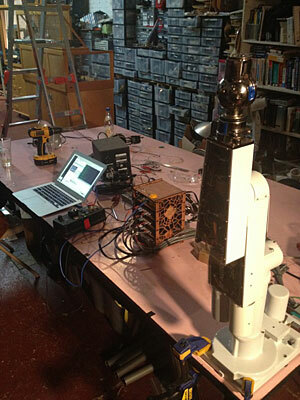 Trammell Hudson's PUMA robotic arm setup at NYC Resistor, with laptop running kinematics library, homemade controller stack, and robot. I saw a different kind of revolutionary accessibility at work when I visited Trammell Hudson at NYC Resistor, a hardware collective in Brooklyn. I came across Hudson through a blog post he wrote detailing his rehabilitation of a pair of industrial robots — reverse-engineering their controls and building his own new controller stack in place of the PLCs that had operated them before they were salvaged from a factory with wire cutters. “The arm itself has no smarts — just motors and quadrature encoders,” he says. (Even the arm’s current position is stored in the controller’s memory, not the robot’s.) Hudson had to write his own smarts for the robot, from scratch — intelligence that, when the robot was new, resided in purpose-built controllers the size of mini-fridges but that today can be built from open-source software libraries and run on an inexpensive microprocessor. The robot’s kinematics — the spatial intelligence that decides how to get the robot’s hand from one place to another by repositioning six different joints — run on Hudson’s laptop. He’s interested in building those mathematical models directly into a controller that could be built from widely-available parts by anyone else with a similar robot, which could give second lives to thousands of high-quality industrial automation components by taking discarded machines and assigning new intelligence to them. “The hardware itself is very durable,” Hudson told me. “The software is where the interesting things are happening, and the controllers age very rapidly. “We went through a white-collar dark ages in the 1980s,” Hudson said. “People stopped building things. No one took shop class.” Now hardware components, abstracted and modularized, have become accessible to anyone with a technical mindset, who can improve the physical world by writing more intelligence onto it. I read this piece in the New York Times the other day and have read it two or three more times since then. It dives into the controversy around DARPA’s involvement in hacker space funding. But frankly, every time I come across this controversy, I’m baffled. I usually associate this sort of government distrust with Tea Party-led Republicans. The left, and even many of us in the middle, generally have more faith in government institutions. We’re more likely to view government as a tool to implement the collective will of the people. Lots of us figure that government is necessary, or at least useful, to accomplish things that are too big or hairy for any other group of citizens to achieve (in fact, a careful reading of Hayek will show even he thought so – commence comment flame war in 3 ..2 ..1 …). So, to summarize, the right dislikes big government and typically the left embraces it. At least, right up until the moment the military is involved. Then the right worships big government (largely at the temple of the History Channel) and the left despises it. Of course, I don’t know anything about the politics of the people criticizing this DARPA funding, just that they are worried that defense money will be a corrupting influence on the maker movement. Which would imply that they think Defense Department values are corrupting. And they might be right to have some concerns. While the U.S. military services are probably the single most competent piece of our entire government, the defense industrial complex that equips them is pretty damned awful. It’s inefficient, spends more time on political than actual engineering, and is where most of the world’s bad suits go to get rumpled. And there is no doubt that money is a vector along which culture and values will readily travel, so I suppose it’s reasonable to fear that the maker movement could be changed by it. But what everyone seems to be missing is that this isn’t a one-way process and the military, via DARPA, is essentially saying “we want to absorb not just your technology but the culture of openness by which you create it.” That’s an amazing opportunity and shouldn’t be ignored. The money is one vector, but the interactions, magical projects, and collaboration are another, perhaps more powerful vector, along which the values of the maker movement can be swabbed directly into one of the most influential elements of our society. This is opportunity! O’Reilly is participating in the DARPA MENTOR program and Dale has already discussed our involvement at length. So I need to disclose it, but this post isn’t about that. This post is about the idea that the military has been a change agent in our society many times before. This is an opportunity to do it again and for makers to influence how it happens. For quite a few years, I worked in the defense space and, frankly, took a lot of crap for it from my friends on the left coast. But I always felt that the military was an important part of American society regardless of whether you agreed with its purpose or actual use, and that the best way to counter its less desirable tendencies was to engage with it. So while I worked my day job I also spent those years aggressively advocating open source software, emergent and incremental software processes, and “permissionless programming” web platforms for the DoD. I thought that the military could benefit from all of these things, but I also explicitly felt that they were a vector along which the cultural attributes of openness, transparency, and experimentation would readily travel. Those open and emergent ideas were a culture virus and I intended to shed them everywhere I could. If you’re a technologist, you know that the military has always pushed the envelope. Silicon Valley itself began with Stanford’s government partnership during the Second World War. The world’s first interactive computer was Whirlwind, a component piece of the massive air defense program SAGE. So, if your vision is to unleash a democratized third industrial revolution based on the maker model, this is your opportunity. If you can insert open culture and values into the defense establishment at the same time, even better. The judge presiding over the Oracle/Google case learned Java, and that skill came in handy when coding specifics arose during the trial. It's proof that coding is a part of cultural competence, even if you never do it professionally. So, here we are with all of this disruptive big data technology, but we seem to have lost the institutional wherewithal to do anything with it in a lot of large companies, at least until package solutions come along. Schoolers, Edupunks and Makers are showing us what's possible when learners, not institutions, own the education that will define their lives. John Allspaw discusses DevOps in high-volume web companies and the importance of cooperation between development and operations. Velocity 2012: Web Operations & Performance — The smartest minds in web operations and performance are coming together for the Velocity Conference, being held June 25-27 in Santa Clara, Calif. Save 20% on registration with the code RADAR20. Five Tough Lessons I Had To Learn About Healthcare (Andy Oram) -- I don't normally link to things from Radar but this gels 110% with my limited experience with the healthcare industry. Makematics: Math for Makers -- I want the hardware hackers who are building the next generation of DIY 3D printers to be able to turn topological algorithms and concepts into open source tool path generation software that creates more efficient gcode and enables the fabrication of previously impossible physical forms. I don’t know the best way to go about this, but this site is intended to act as home for my experiments. 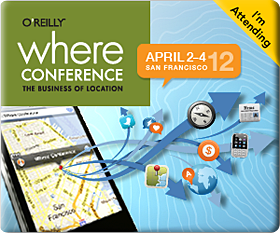 The program for Where, our geolocation and mapping conference, is almost complete. Now we're looking for makers, hackers, developers, and DIYers to bring awesomeness to the 2012 Where Conference (April 2-4 in San Francisco). There are three ways to participate. Fetch info about the owner of a swiped badge. Show the owner of a swiped badge where they are supposed to be next, according to their personal schedule. Send the owner of a swiped badge a message via the attendee directory. Make two owners of swiped badges contacts within the attendee directory. Mini Maker Faire setup includes a four-inch skirted, countertop-level table, Wi-Fi and power. Acceptances will be rolling. The deadline to get your proposal in is March 1, so apply soon. If your project is accepted for any of the above, you'll receive a pass to Where. Where Conference 2012 — O'Reilly's Where Conference, being held April 2-4 in San Francisco, is where the people working on and using location technologies explore emerging trends in software development, tools, business strategies and marketing. California and Bust (Vanity Fair) -- Michael Lewis digs into city and state finances, and the news ain't good. Tonido Plug 2 -- with only watts a day, you could have your own low-cost compute farm that runs off a car battery and a cheap solar panel. William Gibson Interview (The Paris Review) -- It's harder to imagine the past that went away than it is to imagine the future. What we were prior to our latest batch of technology is, in a way, unknowable. It would be harder to accurately imagine what New York City was like the day before the advent of broadcast television than to imagine what it will be like after life-size broadcast holography comes online. But actually the New York without the television is more mysterious, because we've already been there and nobody paid any attention. That world is gone. Zen and the Art of Making (Phil Torrone) -- thoughts on the difference between beginners and experts, and why the beginner's mindset is intoxicating and addictive. Looking for the future? Watch the "crackpots"
Attention in the tech space is generally bestowed upon massive incumbents or hot new startups. The small teams and lone enthusiasts rarely get a mention, let alone major media coverage. But if you're looking for what's next — the envelope-pushing stuff and the tech that will shape our world in years to come — you need to expand your field of vision to include the "crackpots." This point was the crux of an energetic discussion between Tim O'Reilly and Charlie Rose at the IAB Mixx Conference & Expo. You'll find comments and additional discussion about this interview in this Google+ thread. How will a "long, slow make" transform our society? It's arguable that with the arrival of touch displays, the current form factor for the smartphone is going to be with us for some time to come. You can't get much simpler than a solid block of glass and aluminum with a button. Unless you remove the button. Thinking about it, that's probably a solid suggestion — I'd look for that next. If things aren't going to change very much on the surface, underneath the glass things might not be much different either. Oh, the devices will be faster, and they'll have more cores, better displays, faster network connections, and the batteries will last longer. But fundamentally, they'll still be the same. The device won't provide you with any new levers on the world. With the exception of NFC, which admittedly is a big exception, there are no new sensory modalities on the horizon that are likely to be integrated into handsets. You'll interact with your smartphone tomorrow in much the same way you interact with it today, at least in the near term. That said, it's quite possible that your smartphone will interact with the world in a very different way. That's because the next mobile war has already begun, and you've seen nothing yet. It began quietly, with little noise or fanfare, just over two years ago with Apple's announcement of iOS 3, the External Accessory Framework, and the opportunity for partners in the MFi program to build external hardware that connected directly to the iPhone. For the first time, it was easy, at least for certain values of easy, to build sensor hardware that connected to a mass-market mobile device. And for the first time, the mobile device had enough computing power and screen real estate to do something interesting with the sensor data. Except of course, it wasn't easy. While initially the External Accessory Framework was seen as having the potential to open up Apple's platform to a host of external hardware and sensors, little of the innovation people were expecting actually occurred. Much of the blame was laid squarely at the feet of Apple's own MFi program. There was some headway made using the devices as sensor gateways, mainly in the medical community, which Apple had initially pushed heavily during the launch. But in the end, the framework was used to support a fairly predictable range of audio and video accessories from big-name manufacturers — although more recently there have been a few notable exceptions. Things stayed quiet until earlier this year when Google announced the Android Accessory Development Kit (ADK) at Google I/O in May. While there was a lot of criticism of Google's approach, it was justifiably hailed as a disruptive move by Google in what had become a fairly stagnant accessories market. Philip Torrone hit the right note when he speculated that this might mean the end of Apple's restrictive MFi program. I've talked about the Arduino here before. It allows rapid, cheap prototyping for embedded systems. Making Android the default platform for development of novel hardware was a brilliant move by Google. Maybe just a little too brilliant. Around the middle of the year, right in the middle of Apple's WWDC conference, I was approached by Redpark and sworn to secrecy. Apple was on the brink of approving a serial cable for iOS that they would let Redpark sell into the hobbyist market. I'd known about the existence of the cable since the preceding November with the release of the SkyWire telescope control kit. I'd begged Redpark for developer access to their cable, and after signing a thick stack of NDAs, I got my hands on one around mid-December. At the time there seemed little chance of Apple ever approving the cable except for specific use cases where the cable and an accompanying iOS application were approved together as part of the MFi program — exactly as Apple had for Skywire for telescopes and Cisco had for networking gear. The news that the cable might soon be generally available to hobbyists was surprising. Despite Apple's beginnings — and the large community of indie developers surrounding its products — the hobbyist market isn't something Apple is known for caring about these days. Quite the opposite: Apple is notorious for keeping its products as closed as possible. Controlling an Arduino with an iPhone. Close on the heels of Google's ADK announcement, Apple's sudden enthusiasm was suspiciously timed. Someone high up at Apple had obviously realized the disruptive nature of the ADK and this was their response, their counter-attack. Despite the Android ADK actually being an Arduino, it was now easier to talk to an Arduino from iOS using Redpark's cable than it was to talk to an Arduino from Android. The Android ADK board is only now appearing in large numbers as the open hardware community gears up to produce compatible boards cheaper than Google's ruinously expensive initial batch of "official" developer boards. The Redpark cable also faced supply issues, with the initial production run selling out on the Maker Shed within a few days. We're only now seeing it in larger volumes. So, despite appearances, it's still the early days. Discussing the Redpark cable at OSCON 2011. I think the availability of both these products is going to prove to be amazingly disruptive in the longer term. After spending two days at the recent World Maker Faire in New York, I know there's a lot of enthusiasm inside the Maker community for that disruption — and Apple may have the edge. Because of Apple's policy restrictions, you can only develop applications that work with Redpark's cable for your own personal use or for distribution inside an enterprise environment without going through the MFi program. The ease of use and popularity of the iOS platform with developers means there will still be a big uptake, and after a few people struggle through the process, I think that, with time, the cable will spell the end of the MFi program. Over the next couple of years, we'll be seeing some real innovation in the external accessory product space. Rapid prototyping combined with ease of access to increasingly powerful mobile platforms means that the next mobile war, and the next big thing of a real ubiquitous computing environment, is just around the corner. Stereotypes of what scientists do, how they act, what they look like persist as Eri Gentry noted in her keynote at last week's OSCON. To illustrate, Gentry pointing to the "before" and "after" pictures drawn by seventh-grade visitors to Fermilab. Hopefully, the notion of a quiet (or mad) scientist, isolated in the lab, will soon be uncommon as citizen and DIY science projects like BioCurious take shape. In her keynote, Gentry described what it was like to be a non-scientist doing science. She also addressed the struggles that many scientists, regardless of background, face: a lack of access to the tools they need for research. Lab space is often restricted to universities or big corporations, and lab rentals, when available, can be exorbitant. But following a successful Kickstarter campaign, BioCurious will provide a collaborative lab space for biotech at a much lower rate. The availability of an affordable and accessible space is one thing; the availability of tools is another. As Gentry highlighted, with a combination of open source software and off-the-shelf parts, it's also possible to build lab equipment that costs far less: a $125 DIY clean bench (regular price $12,000), a $55 Dremel-based centrifuge (compared to a $500 centrifuge). But hacking science isn't just about "making things," as Spacehack's Ariel Waldman argued in her OSCON keynote. It's about making "disruptively accessible things." In her talk, Waldman talked about some of the ways in which that accessibility is occurring in space exploration. It isn't as simple as opening up the massive datasets we have from satellites and space missions — although that's part of it. It's about making sure that data isn't "buried deep within a government website" or locked in an unintelligible interface or format. And it's about making sure that people can actively contribute and that when they do, they receive credit for their work. As Gentry described it in her talk at OSCON, these open science efforts are done "out of necessity and out of passion." Opening access to data, equipment and lab space this way puts science in the hands of makers, creators, developers, scientists, citizens — anyone. And this in turn will hopefully spur more innovation and discovery. Strata Conference New York 2011, being held Sept. 22-23, covers the latest and best tools and technologies for data science -- from gathering, cleaning, analyzing, and storing data to communicating data intelligence effectively.